To day most of us have multiple devices like computers laptops, tablets and smart phones, and we want access to our email on all of those devices and from different locations. The good news is that provided you pick the right access method it is very easy access your email from remote locations and on multiple devices and clients. There are three Protocols used for accessing email. With HTTP (Webmail) and IMAP4 all email is left on the Email Server, and accessing your Email account using a client/device configured to use these protocols has no negative impacts on the other clients. However accessing using POP3 clients has associated problems because of the way it is designed to work. The most common problem that you encounter when one of your clients uses POP3 is that you may find that Email is missing. This problem arises because the default behaviour for POP3 is for the client to move the email from the email server to the email client. 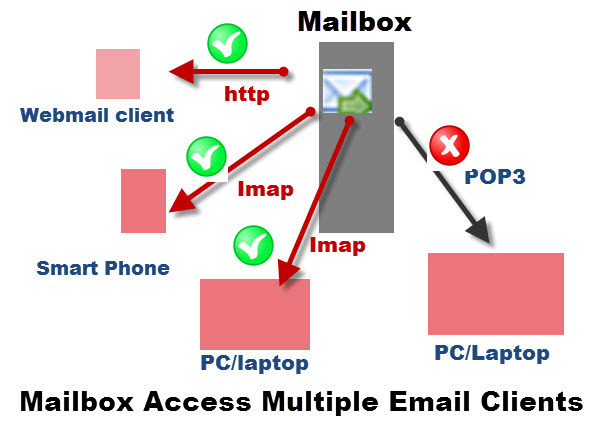 So if client A accesses the email first using POP3, and then later on client B tries to access the email it can’t access it, as it is no longer on the email server, but instead it is on the device of client A.
Don’t use POP3 but use IMAP4 or Webmail which leaves the email on the server by default. If You change this default behaviour, and leave a copy of the message on the email server then you now have two copies of the message. One stored in your mailbox on the email server, and one stored in your local mailbox on your PC. The setting for Outlook Express is on the advanced tab of the account properties under delivery. You just need to tick the box leave a copy of the message on the server. after a period of days or when deleted from the deleted items. providing you have plenty of space it is OK to do this. It can however cause problems if you decide to configure a new POP3 email client to access the mailbox ,as you have to wait a very long time while it downloads all the old emails. In addition because POP3 email is client centric and not server centric, when you send an email from client A you will not see that sent email in client B. When accessing a mailbox using multiple devices/clients use web based clients or IMAP4 clients and try to avoid using POP3.